Need a new twist for an Easter dessert? 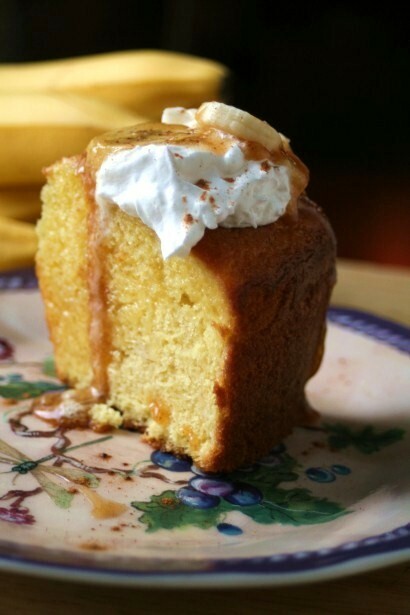 Try this cake version of the famous New Orleans dessert . Man oh man is this good. If you love bananas foster you will love this cake. Nuff' said! Preheat oven to 350 degrees. Mix all ingredients for the cake. Grease a fluted or bundt pan. Pour batter into pan and bake according to package directions. Mix whipped topping with coconut and set aside. Melt the butter in a large skillet. Add brown sugar, cinnamon and caramel sauce. Cook over medium heat, stirring constantly, until bubbly. Add bananas, and cook 2 to 3 minutes or until thoroughly heated. Remove from heat. Ice cake with whipped topping mixture and spoon banana sauce over top. Serve. This is a perfect Easter dessert! I know I would love this! Sounds amazing! I love bananas Foster. I recently made a bundt cake with that flavor and it was delicious. Oh this looks so good! That sauce sounds divine! Thanks for sharing on foodie Friday.